To you who listen over the radio you are sharing with us these services of the First Baptist Church in Dallas. This is the pastor bringing the eleven o’clock hour’s message entitled Unto Them That Wait For Him. For the last five months your pastor has been preaching in the ninth chapter of the Book of Hebrews. 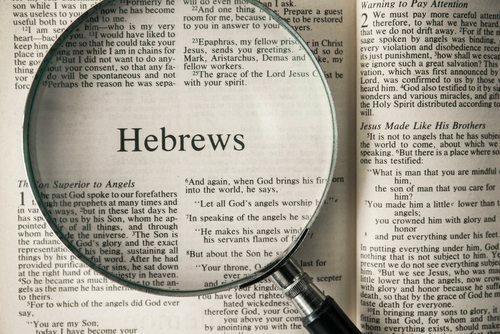 And after the passing of these months, we come now to the closing words of Hebrews chapter 9. For then must He often have suffered since the foundation of the world: but now once in the end of the age hath He appeared to put away sin by the sacrifice of Himself. And as it is appointed unto men once to die, but after this the judgment: So Christ was once offered to bear the sins of many. And the great chapter concludes with this glorious word: “And unto them that look for Him shall He appear the second time without sin unto salvation” [Hebrews 9:28]. Thrice does the author here refer to the appearances of our Lord. Historically, in the past; once, in the end of the age, at the conclusion of the oldest dispensation did He appear to put away sin by the sacrifice of Himself [Hebrews 9:26]. Then in the present; Christ is not entered into an earthly sanctuary made with hands—a figure, a type of the true, which is in glory––but He is entered into heaven itself, into that true and eternal sanctuary “now to appear”––the second time he uses the word––”now to appear in the presence of God for us” [Hebrews 9:24]. our great Intercessor, our Mediator, our Supplicator, our Advocate is in heaven pleading for us. Then the third is in the future: “Unto them that look for Him shall He appear the second time, apart from sin unto salvation” [Hebrews 9:28]. The next time we see Him—no crown of thorns [Matthew 27:29], no agony in the garden [Luke 22:44], no suffering of death [Matthew 27:32-50], no sobs and tears, no blood and crying [Matthew 26:28; Luke 19:41]—apart from sin that He did once when He died on the cross [1 Peter 2:24]. The next time He shall appear in the diadems of glory, bearing the crowns of the angels above and the earth beneath—the second time apart from sin unto salvation [Hebrews 9:28]. Now the sermon concerns that word, “unto them that wait for Him, unto them that look for Him shall He appear the second time without sin unto salvation” [Hebrews 9:28]. That word in the Greek is apekdechomai. It is used seven times in the New Testament, always with that same meaning. It is translated sometimes “to wait,” sometimes “to look for.” Apekdechomai is the Greek word meaning “to expect earnestly, fervently; to wait for patiently, devoutly, prayerfully.” I shall read to you all seven instances where that word is used in the New Testament. In the eighth chapter of the Book of Romans, like the ninth chapter of the Book of Hebrews, one of the great, great chapters of the Bible—in chapter 8 of the Book of Romans, Paul says, “For the earnest expectation of the creation waiteth,” there it is, “for the manifestation of the sons of God. For the creation was not made subject to vanity willingly,” but God allowed it, “that it might be subjected in hope, looking for,” waiting for, “that great manifestation” [Romans 8:19-20]. That’s the first time it’s used. The second time, “And not only they, the whole creation that groaneth and travaileth in pain together unto now” [Romans 8:22]; the whole earth was cursed for the sake of man; the earth with the thorn and the brier, the desert waste of the continent, the salt of the seas, the barrenness of the planets above. “The whole creation travaileth in pain together until now. And not only they, the creation, but we ourselves also who have the first fruits of the Spirit, even we ourselves groan within ourselves waiting” [Romans 8:22-23]. There it is again, the second time it’s used; “waiting for the adoption, to wit, the redemption of the body” [Romans 8:23]; saved in our spirit, born again, regenerated when we are converted. But the Book says that’s not the end. There shall be a redemption of the whole precious possession. The body shall be redeemed as well as the spirit and the soul, waiting for that great consummation, to wit, namely, the redemption of the body [Romans 8:23]. The third time it is used, “For we are saved by hope”: he says, “but hope that is seen is not hope: for what a man seeth, why doth he yet hope for it? But if we hope for that we see not, then do we with patience wait for it, apekdechomai? If we hope for that we see not, then do we with patience look for it?” [Romans 8:24-25] Prayerfully, devotedly, expectantly, waiting for it. The fourth time he uses it is in 1 Corinthians 1:7, “waiting for the coming of our Lord Jesus Christ,” apekdechomai, expectantly looking, patiently waiting for the coming of the Lord Jesus Christ. The fifth time he uses it is in the Book of Galatians, the fifth chapter and the fifth verse: “For we through the Spirit wait for the hope of righteousness by faith” [Galatians 5:5]. The sixth time he uses it is in Philippians 3: “For our citizenship is in heaven” [Philippians 3:20]. “For our citizenship is in heaven; from whence also we look for” there it is again, “wait for,” apekdechomai, “from whence also we look for the Savior, the Lord Jesus Christ: who shall change our body of humiliation,” sentenced to death, and age, and illness, “that it may be fashioned like unto His glorious body, according to the working whereby He is able even to subdue all things even unto Himself” [Philippians 3:20-21]. The power of God is in it. Our citizenship is in heaven; from whence also we apekdechomai, look for, wait for, expect the Savior, the Lord Jesus Christ. And the seventh time it is used is in my text in the ninth chapter of the Book of Hebrews and the twenty-eighth verse: “And unto them that apekdechomai, that look for Him shall He appear the second time without sin unto salvation” [Hebrews 9:28]. The secret of a man’s life is to be found in what he looks for and what he expects. If the life is filled with darkness and gloom, it’s because the man looks for defeat, and disaster, and trial, and trouble. If a man’s life is filled with light, and glory, and gladness, it’s because he looks for and expects ultimate triumph and victory. You will find in that the key, the secret to the dynamic overcoming spirit of those first and primitive apostles. The Book says that when our Lord was crucified, and died, and then raised [Luke 23:26-24:6], was taken from them into glory that the disciples returned to Jerusalem with great joy and gladness, praising God daily in the temple [Luke 24:51-53]. Why? Their Lord had been taken from them, and yet they are in the midst of Jerusalem, filling the whole city with the glory and gladness of their faith, as the Holy Spirit filled their hearts [John 14:17]. Why? The answer is very simple. They have in their heart a great promise: “Ye men of Galilee, why stand ye gazing steadfastly up into heaven? this same Jesus, which is taken up from you into heaven, shall so come in like manner as ye have seen Him go” [Acts 1:11]. Standing there steadfastly gazing into heaven, we can hardly know what. The Lord knows when to speak to His children and what. And the great, glorious, incomparable announcement is made: “This same Jesus shall so come in like manner as ye have seen Him go” [Acts 1:11]. He went away in a body. He shall return in a body—the Man Christ Jesus [Acts 1:11]. The disciples saw Him go; His disciples shall see Him return. He went away in a cloud, the shekinah glory of God; He shall return in the same glory, in the same shekinah, in the same cloud. He went away with angels [Acts 1:9]; He shall return with ten thousands, and thousands, and thousands of His angels [Jude 1:14]. He went away into heaven; He shall descend from heavens [Acts 1:11]. The glory of the secret of those early apostles is to be found in that marvelous, incomparable promise. Though the Savior is absent and ascended up into heaven, He is coming again [Acts 1:11]. You will find that same secret to be found in the terrible years of the persecution of the early and primitive church. How were they able to withstand the wasting, the destruction of the whole combined ferocious, diabolical energies of the Roman Empire and to do it through the generations and for three hundred years? You will find it in that glorious and incomparable hope. As the author of the Book of Hebrews says, writing to that little church undergoing such terrible persecution; he speaks of their affliction, and all of the burdens, and all of the confiscation of property, and the despoiling of themselves. Then he says, “Yet a little while, and He that shall come will come, and will not tarry” [Hebrews 10:37]. Among those early disciples, there were watchwords that they said to one another. One of them you will find at the close of this first Corinthian letter, maranatha, “the Lord cometh” [1 Corinthians 16:22], and another one, “achri hou elthei, till He come, till He come” [1 Corinthians 11:26]. On a crowded street or in the dead of night that word of Christian recognition and greeting was passed between the children of the Lord. Sometimes the face of a weary stranger would light up as the greeting of kindness and courtesy was extended, achri hou elthei. And sometimes, as the martyr walked to the stake or to the arena, his praying companions in the Christian faith would raise their voice in that final greeting, maranatha, maranatha, “the Lord, the Lord cometh.” And that hope has lived in the heart of the churches of Jesus Christ through the centuries that have multiplied since. This is not all. There is another chapter. There is a great consummation. There is a final denouement. Not forever will the world be wasted by sin. Not forever will families be dissolved and broken by sin. Not forever will Satan remain unchained and unloosed. Someday, some glorious day there shall be a final consummation of the age when God Himself intervenes in human history, and death is no more, and the grave is no more, and sin is no more, and all of the toil and labor, the sorrows and trials of this life are passed away [Revelation 21:4]. You will find that hope constantly reappearing in the worship services of the church. Throughout the years they have loved to repeat the Lord’s prayer [Matthew 6:9-13]. “Our Father which art in heaven, Hallowed be Thy name. Thy kingdom come,” no kingdom without a king. “Thy kingdom come,” when our Lord shall appear apart from sin [Hebrews 9:28], no longer crowned with thorns [Matthew 27:29]; the diadem of the ages upon His brow [Revelation 19:12], “Thy kingdom come” [Matthew 6:9-10]. You will find it in the Apostles’ Creed. No man knows where it came from, how long it has been used. I believe in God the Father Almighty, Maker of heaven and earth. And in Jesus Christ His only Son our Savior; who was conceived by the Holy Spirit, born of the Virgin Mary, suffered under Pontius Pilate, was crucified, and buried. The third day He rose from the dead. He ascended into heaven, and sitteth at the right hand of God the Father Almighty; from thence He shall come again to judge the quick and the dead. You will find it in the Christian committal service used for the centuries and the ages: “Earth to earth, ashes to ashes, dust to dust: looking for the resurrection of the dead and the light of the world to come through our Lord Jesus Christ, at whose appearing in glorious majesty, the earth and the sea shall give up their dead, and the mortal bodies of them that sleep in Him shall be changed and made like unto His own glorious body” [Philippians 3:21]. And you find it again every time the church gathers together for the breaking of bread. This is My body; eat in remembrance of Me. This is My blood, shed for the remission of sin; drink in remembrance of Me. For as often as ye eat this bread, and drink this cup, ye do show the Lord’s death, achri hou elthei, till He come, till He come. But the passing of the years has done something to the Christian church and to the faith of Christian people. Gone is that early fervor. Gone is that indescribable expectancy. We have become weary of waiting. To the church the doctrine has become controversial. It’s a thing to divide over. It’s a thing to quarrel about. It’s a thing to discuss, to philosophize about. And, of course, in many, many places it has come to be a sign of the frailty and of the human limitations of those first apostles who uttered it, and believed in it, and expected it, and waited for the coming of the Lord. People who are of a turn to set dates and time have made the great promise ridiculous. Is our Lord really coming? That’s no question raised by us. Even in the days of Simon Peter who wrote in his second letter: “There shall come those who deride and ridicule, saying, Where is the promise of His coming? For since the fathers fell asleep,” for generations back, “all things continue as they were from the beginning of the creation [2 Peter 3:3-4], and will continue through the unlimited eons and forever and forever. There is not any risen Lord. There’s not any glory beyond the skies. There’s not any coming again, and there’s not any hope beyond the grave. “There’s no hope. When we die, it is forever. There’s no Lord. When He died, He died forever. And there’s no overcoming of the terrible might and power of Satan, and of sin, and the grave. This is all.” So says the infidel. So says the pseudoscientist. So says the unbeliever. So says the scoffer. But, oh! Oh! Simon Peter says you’re measuring by our time and our clock. By the clock of God, “with the Lord, a thousand years is as but a day, and a day as a thousand years” [2 Peter 3:8]. Time is a creation like space, and distance, and matter. Time is a brief interlude in the great ages and eternities of God. We stand on a little neck of land between the ages before and the ages since. And for us to measure God’s eternity by the little thing that we cut up into minutes and days is of all things most foolish. We are to believe and trust in the immutable promises of God. And as the author of the Hebrews says, “Though He tarry, yet shall He come” [Hebrews 10:37]. He came the first time though long delayed. When Cain was born to Eve—there are some commentators who believe that explanation of Eve, when she “looked upon her first son” [Genesis 4:1], means that she thought that that first boy was “the promised Seed that should bruise the serpent’s head” [Genesis 3:15]. In the centuries since, all of the maidens that were born in Israel thought for and hoped for that she might be the mother of that foretold and foreordained Child. The hope never died; He is coming! And the years passed; He is coming! And the centuries passed; He is coming! And the millenniums passed. But one day, one glorious day when the angels sang [Luke 2:13-14], and the stars pointed out [Matthew 2:1-2, 9-10], and the wise men came to worship [Matthew 2:2], and the shepherds bowed to adore [Luke 2:8, 15-16]; one day He came [Luke 2:10-11]. It shall be no less certainly true again. Though the years multiply into centuries and the centuries multiply into millenniums, one great, glorious, all‑eventful, significant day God shall appear! [Hebrews 9:28]. He shall not tarry. He shall come quickly, suddenly, immediately; the glorious presence of the Son of God [Matthew 24:44]. We are sometimes persuaded that history, and humanity in it, is like a vast flat plain upon which men wander blindly and helplessly, always returning back to the dead fires of their former camps. No, not according to the Word of God; according to the Word of the Scriptures life is a golden, shining stairway toward which men are to lift up their faces, apekdechomai, expectantly, hopefully, prayerfully, up and up and up and up. And at the head of that golden stairway stands the Son of God, our Savior, the Lord of the world [1 Timothy 6:15]. “Unto them that wait for Him shall He appear the second time apart from sin unto salvation” [Hebrews 9:28]. If there is any comfort in the Savior’s words, that must be true. Our Lord said––and I wonder how many Bibles you’d find, turning to the fourteenth chapter of the Book of John––I wonder how many Bibles you’d find, and as you look at the leaf, it is tear‑stained. Some dear mother read this when her son passed away. Some dear child of God read this when a loved friend passed away. Some dear child read this when mother, when father passed away. And as they read the tears fell unobserved on the leaf of the Book: “I go to prepare a place for you. And if I go and prepare a place for you, I will come again, and receive you unto Myself; that where I am, there you may be also. I will come again” [John 14:2-3]. If it isn’t true, there’s no comfort in it. If it is true, we do not mourn as those who have no hope [1 Thessalonians 4:13]. The infallibility and integrity and authority of the Word of God itself depends upon the promise [1 Corinthians 15:16-19]. Paul speaks of it, writes letters concerning it. Simon Peter does the same, and John. The whole Revelation is to depict that final ultimate triumph [Revelation 1:1-22:21]. If it is not true, if we cannot believe it, the very authority and infallibility and integrity of the Word of God turns to dust and ashes. And if the hope is not true, and to wait is to wait in vain, then death and the ravages of the grave are here forever and forever. The thing that I’ve never been able to personally understand about evolution is this: those who say to me, “Pastor, you don’t understand. There’s the glory of God in evolution. There’s the hand of God in evolution. There’s the great progress of the centuries in evolution. And up, and up, and up, and up, we have raised ourselves from the mud, from the forests, from the arboreal animals into the glorious intelligence of man, and someday, up and up and up into the light of the angel itself.” I can see that. I can see the optimism of it. But what I cannot see is this: granting the tremendous surge of technical achievement, and granting the upward drive of the spirit of man; granting it all, come with me to any cemetery and stand by my side with a broken‑hearted mother and a broken‑hearted father. And look on the grave of a fallen son or a daughter, and comfort their hearts with the glorious promise of the technical improvement of humanity. I cannot see it! However much we may achieve in the days that are to come, what of these who are fallen in the dust of the earth? And it shall not come to them and not come to me. If the Lord tarries, I too shall fall into the grave. You shall come to my funeral or I shall go to yours. Is there not some better thing than just to die? Is there not some more glorious consummation than just the grave? Are we not able to lift up our spirit to behold some more marvelous future than to decay and to die? Is this the meaning of life; to cry, to be broken‑hearted, to dig graves, to become senile and old? Is there not some better thing God has prepared for us? It lies in the hope of the Christian faith. Beyond this hour, beyond this day, beyond these fading flowers, beyond this withering grass, beyond this death, beyond this life, there is a more glorious consummation. It lies in the eternal, immutable promise of the Son of God. “And we who are alive and remain” shall not see Him first, “shall not precede them who are asleep [1 Thessalonians 4:15]. “For the Lord Himself shall descend from heaven with a shout, with the voice of the archangel,” and they shall see Him first; “Then we who are alive and remain, shall be caught up with them in the clouds, to meet the Lord: and so shall we ever be with Jesus” [1 Thessalonians 4:15-17]. Jesus, my Savior, shall come from on high. “And unto them that wait for Him shall He appear the second time without sin unto salvation” [Hebrews 9:28]. Are you ready? If He calls today; if He comes at cockcrowing or at midnight, are you ready? Unto them that wait, that look; that expectantly, fervently, prayerfully hope; unto them shall He appear. Are you ready? We make appeal this morning to your heart. In the balcony round, somebody you; on this lower floor, a family you, as the Spirit of Jesus shall open the door and lead in the way, would you come? Would you come? “Pastor, I give you my hand. I give my heart to God” [Romans 10:9-10], or, “Here we are putting our lives in letter, in the fellowship of the church.” However God shall say the word and lead the way, would you make it now? Would you make it this morning? Would you? While we stand and while we sing.